This web site literally receives Internet traffic from martial arts weapons users all over the planet. We find that martial arts from all over the world use some sort of fighting sticks in their training, if not just to utilize them as short range weapons, to use them to train students against martial arts weapons attacks. Most of our visitors train in the Filipino Martial Arts such as escrima or arnis and seek rattan as their preferred stick or choice, and for good reason. Rattan is strong, compared to exotic woods like bahi and kamagong, and is far less dense. If you have questions about rattan, please see our Rattan Stick FAQ using the link below. Although the pictures below show many sticks, the prices below represent individual stick prices. These rattan sticks are very dense and solid, great for escrima training! Once you get hold of these sticks, you'll love them. Diameter is from 1" to about 1 1/8". If you like your escrima sticks like you like your steak, you'll love these thick sticks! Diameter is from 1 1/8" to about 1 1/4". Diameter is from 7/8" to about 1". Shorter, natural rattan sticks, great for Serrada training. 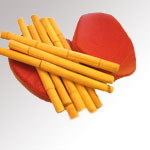 Six rattan pocket sticks 6-8 inches. Take a handful! One bundle of six rattan daggers. Daggers are 12-14 inch rattan sticks.